The country of origin is Andes in South America in gramineous corn, and American's staple food. They are rice, a wheats, and three large grain that queues up. Any type of soil often grows up strongly in the heat if it is a rich soil. Will you comparatively challenge the cultivation of easy corn? The basis of the vegetable growing starts from the preparation for the soil. Any soil is not cared about though it does from the compost making if it does by organic farming because the soil is not chosen. Fermentation starts when organisms such as the grass, the fallen leaf, rice skin, and rice bran that weed are piled up, and water is poured. This is counterattacked many times. When compost can be done, it cultivates it several times with the soil with the tractor and the cropper mixing it. If it is a planter of small-scale cultivation, it is enough also by a soil on the market. You may use the thing marketed as a soil for the flower and the vegetable as it is, and you may mix it with the soil of the field. First of all, to plant corn, the ridge of about 10cm in height is made with the hoe by two rows or more. When the multi is paved, it makes it immediately before planting sowing the kind. The purpose of making the ridge of two rows or more is to improve pollination. To become about 30cm between stocks in around the middle of April - the middle of May, 2-3 a place is seeded to about 2cm in depth. After sowing of the seed, you will multiply the unwoven cloth etc. to prevent the insect damage and the soil being dried. When it worries about the insect damage, raising is more certain in the jar. It plants in the ridge and it puts it when becoming 2-3 true leaves in this case. It thins out to become one a place when becoming 3-4 true leaves. Thinning out often suppresses the root of the left seedling, and doesn't pull it out together. Or, the root of the stock is cut with scissors. When the plant length becomes 40-50cm, phosphatic and compound fertilizer is done and the additional fertilizer of about 30g a square meter is done. The soil drawing is done to the root so that the stock should not fall after this. Moreover, it weeds moderately. 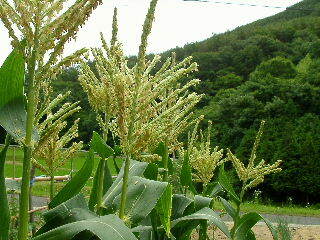 This photograph is a corn male flower. This can be done most up. It pollinates by the pollen of this male flower. If the truth of corn is seen, the seed might become like the tooth omission. Because of not pollinating many of this causes. This photograph is a corn female flower ,in a word, the truth. Because this can be done in some measure on the way, what can be done most up is left. Then, the large one can be harvested. The truth below is taken during the small size. You might leave this in the point of pollination though the boiling bud might come out from stock origin. It doesn't influence amount so much. 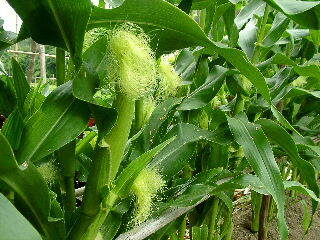 Sugar is resolved to starch as for the sweet corn as time has passed since it harvested and sweetness decreases. It can eat the very sweet one by boiling the taking setting up soon by saying, "Harvest after the fire is put on the pan". It is a proper time of the harvest when a female pistil discolors and it becomes brown. It is possible to harvest easily by knocking it down below. The character of parents with pollen indeed appears to corn when the pollen of a different kind adheres. For instance, when the pollen of popcorn adheres to the sweet corn, it becomes unsavory. This is because two kinds were planted to be near though corn that mixes white and yellow is often seen. When the truth begins to swell to prevent bird's of the crow etc. insect damages, it is possible to prevent it by putting the cotton string which how many black rows it on corn. I think that it is also good to wrap the truth with the bag of a yellow net because it is said that the crow will not see a yellow color contents. I think that the electrified fence is good for the Asian racoon and the wild boar. Narrowing the interval of the hedge to the Asian racoon and making to three steps might be good.